Made using beautiful grey marble that glitters and sparkles in the light, the Modern Innovations classy Wine Chiller Bottle Holder's natural temperature retention and stay-cool properties will keep your wine bottle cool no matter where you are. To use, simply store the holder in the refrigerator before entertaining, then place the bottle inside the chiller for a beverage that stays cold and refreshing longer. Its felt bottom ensures your beloved table, countertops, or desk remains scratch-free and undamaged and its sturdy design and dimensions help avoid unwanted tips and spills when reaching for the wine bottle inside. Large enough to fit the average wine or champagne bottle, this versatile container can also double as a holder for all your kitchen utensils or office supplies. You can also put this gorgeous container to use as a flower vase. A wine enthusiast's dream gift, our wine cooler makes a lovely party, hostess, or housewarming gift coupled with a bottle of wine. 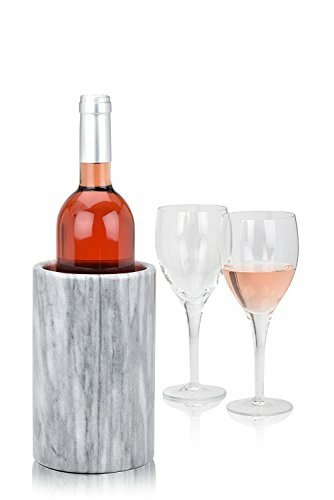 MARBLE WINE COOLER: Made of 100% shimmery grey solid marble with natural temperate retention and stay-cool properties - Shades of Grey May Vary. SMOOTH & SLEEK: This tabletop cooler has a smooth inner and outer surface providing premium quality, durability, and elegance. This versatile bottle holder can be used to hold a beautiful bouquet of flowers, organize kitchen utensils, store office supplies, and more. NATURALLY MADE: Material base helps avoid damage to tables, kitchen counters, and other surfaces. Product Dimensions: 4.5" x 4.5" x 7" tall. GREAT GIFT FOR WINE LOVERS: This item makes for a perfect Mother's Day gift whether your mom loves wine, flowers, or elegant marble centerpieces. Surprise your mom this holiday with a beautiful vase that she will surely love and treasure.